Greetings. 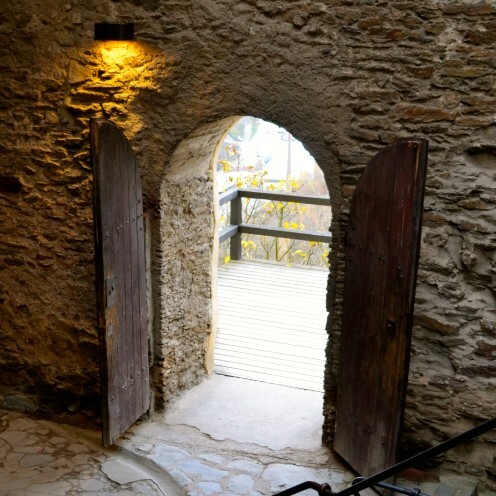 Have you ever wondered what it would be like to live in a real medieval castle? I know I dreamed of such things as a young girl, but now I know better. The only kind of castle I’d like to live in is one with the charm of the old but equipped with all the modern conveniences of the new. 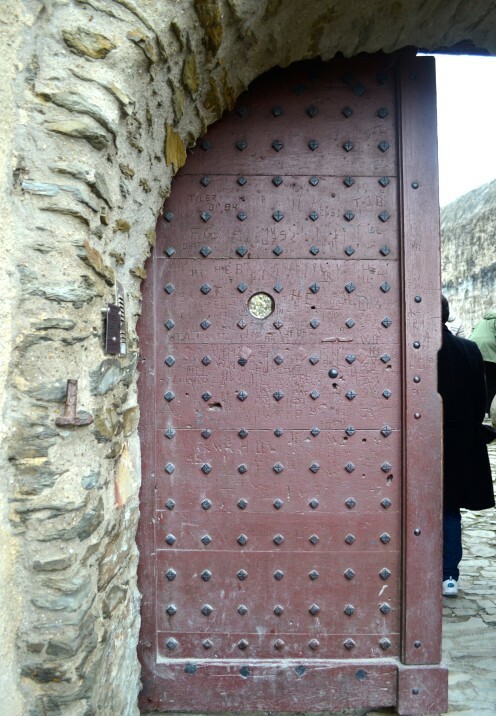 So, while exploring fascinating Marksburg castle on our recent Uniworld cruise down the Rhine river in Germany, I learned first hand that the allure of castle living is absolutely nothing more than a romantic notion. 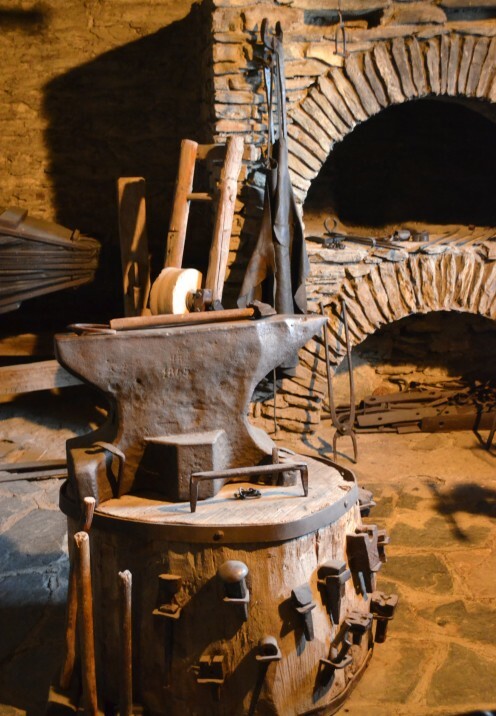 The grim reality is that castles, while stately and large, were actually dirty, smelly & very cold, and were primarily built as fortresses and defensive strongholds rather than stately homes. Bottom line is, they were not very nice places to live. But a girl can dream, can’t she? 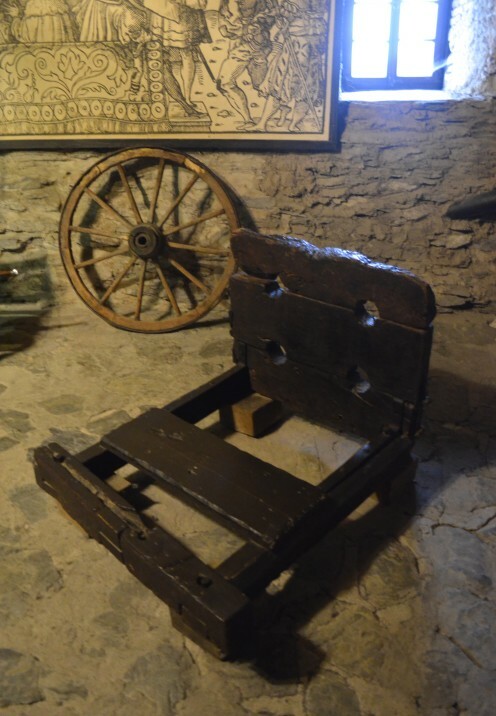 So come dream with me as we explore fascinating Marksburg Castle. 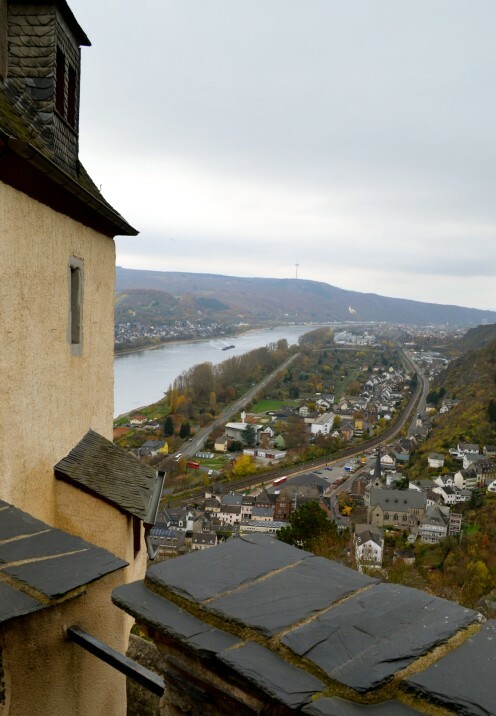 Leaving the charming town of Koblenz behind, we cruised the castle-dotted Rhine river where every bend and twist proved to be the home of yet another castle. 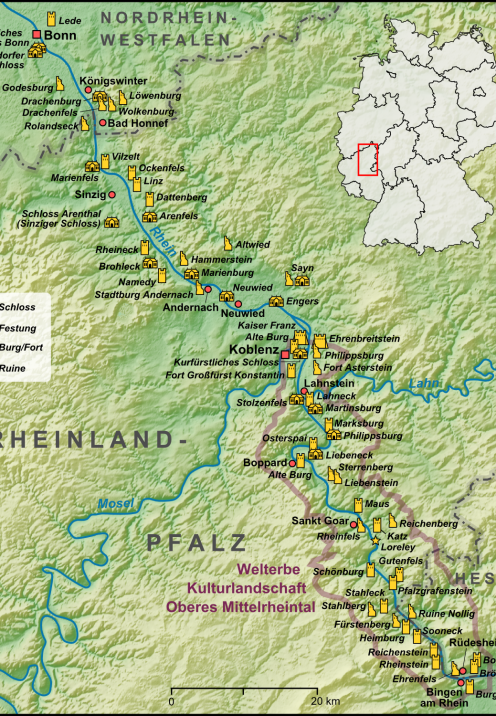 As you can see in the map below, nearly every hilltop was crowned with a fairytale castle. But, rather than being the homes of royalty, they were actually the strongholds of noble families who raised fortresses against one another. Their castles were actually more like armored bunkers, designed to protect their land, their people and their harvest. Furthermore, each one was vying for the wealth that river tolls afforded them. You see, the Rhine was a major trade artery, and these castles were actually toll stations that extorted a payment from anyone wishing to continue further along the route. 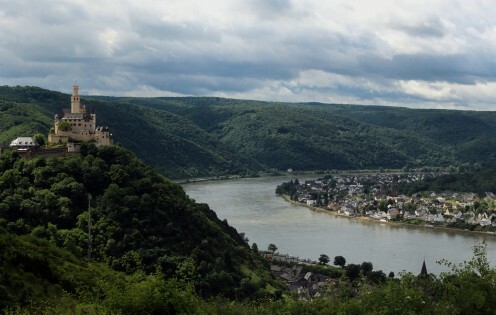 Today Marksburg Castle is one of the principal historical sites along what is known as the UNESCO World Heritage Rhine Gorge. So join me as we enter its impressive iron gateway. 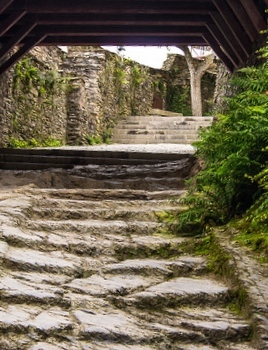 Here it was easy to imagine knights in shining armor thundering through the gates of their castle stronghold, passing under a low hanging bridge and up what was called the Riders Stairway on horseback. 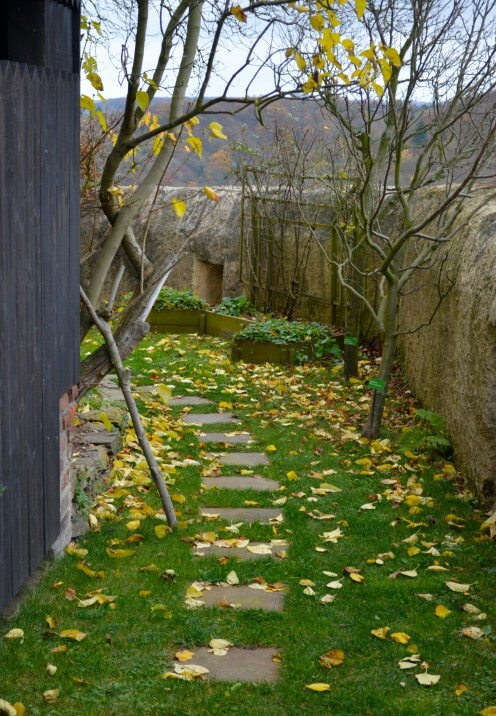 These cobblestones provided a grip for the horses’ feet but made walking on them cumbersome. 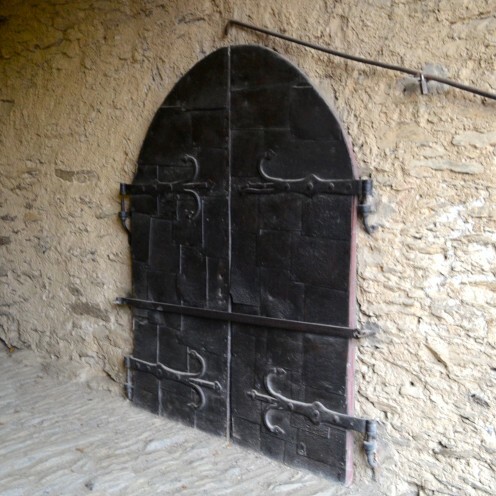 A tour of this castle is not for the feeble and would be impossible to navigate if handicapped. 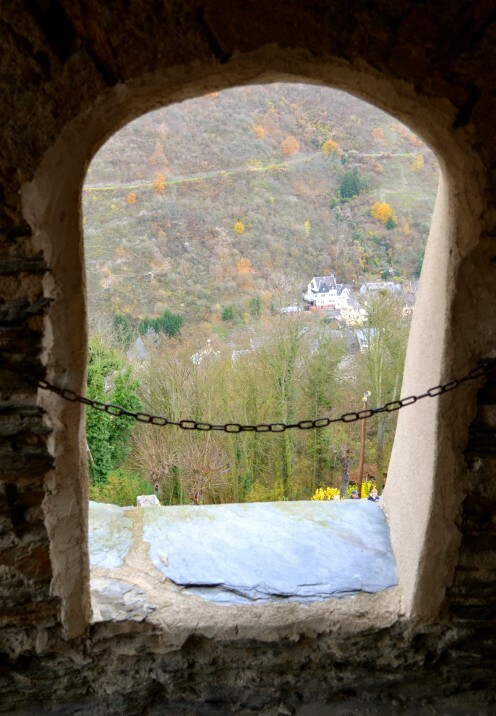 But, getting back to my fairytale…can you just imagine the girls of the castle peering out of these tower windows as handsome knights in shining armor rode by? 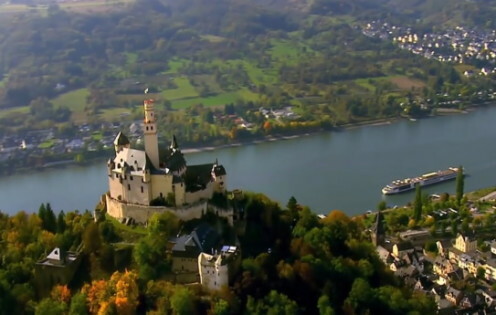 Marksburg Castle sits above the town of Braubach, Germany and is the only hill castle on the Rhine River to have survived the turbulence of warring factions that literally destroyed so many of the castles in the area. 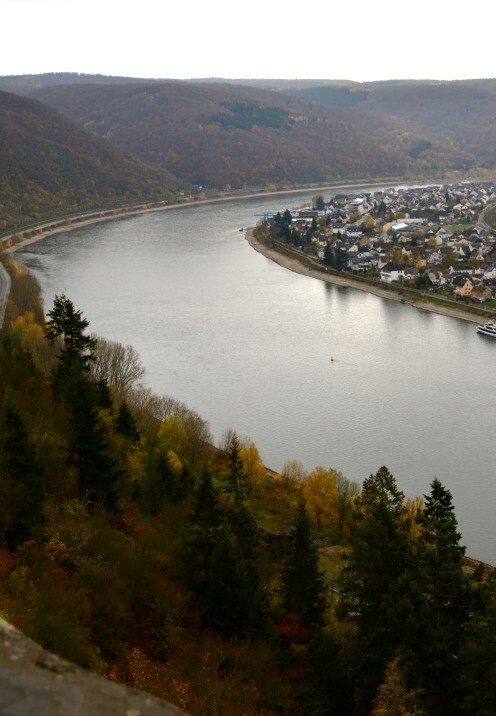 As the only Rhine river castle never to have been destroyed, it has been continuously inhabited for more than 700 years. As we stepped inside one of the first things we encountered were the crests of the families that called this castle home over the centuries. Plaques below them indicate the time period of their residence. 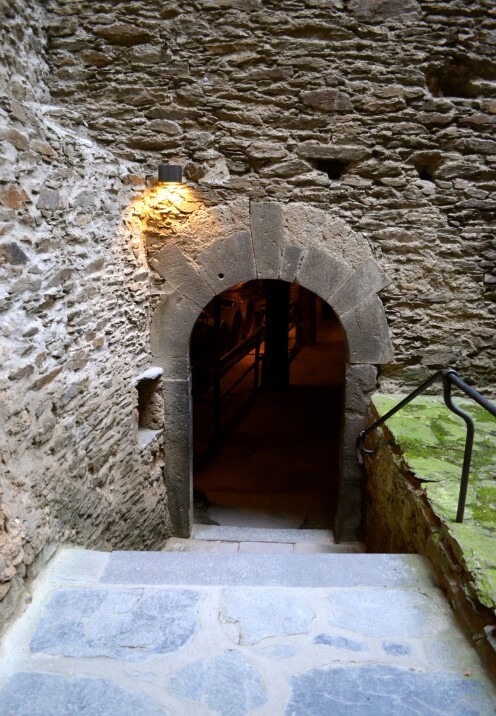 Walking through its cobblestone interior, we really got a vivid sense of what medieval life was like, as this castle has been lovingly preserved to the period. 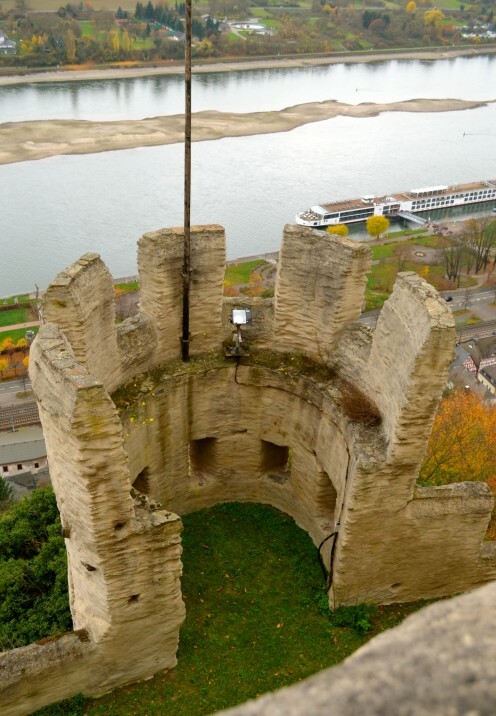 In fact, Marksburg is considered the best-preserved castle on the Rhine. Inside the castle walls they had everything necessary to sustain life. 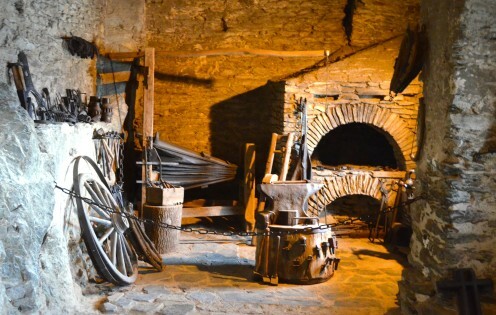 This was the blacksmith shop which looks as though the smith just recently stopped working for the day. Continuing further on our guided tour, we approached the “Great Battery”. 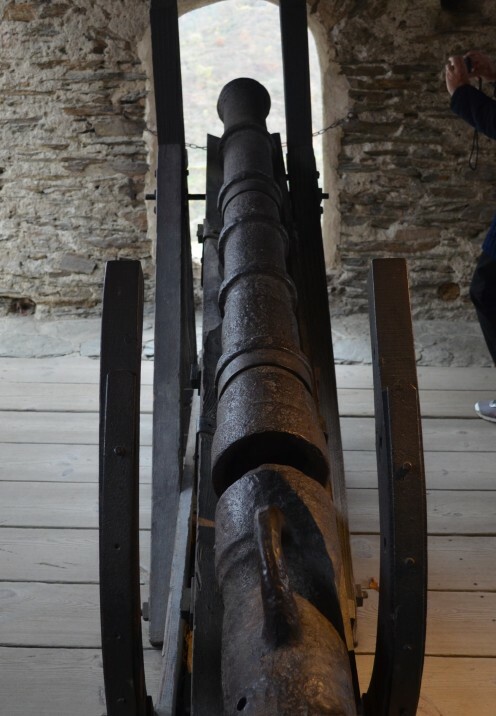 The castle and its many towers and overlooks were constructed to house the cannons that were aimed over the Rhine, protecting the castle, the town of Braubach and its citizens below. 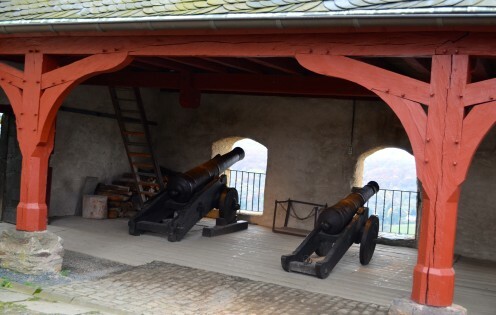 As you can see, these defensive batteries provided a matchless view of the Rhine Valley below. 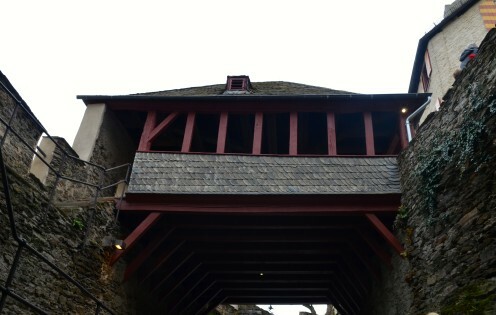 The upper section of the castle is surrounded by a defensive wall along which a narrow walkway was fashioned. 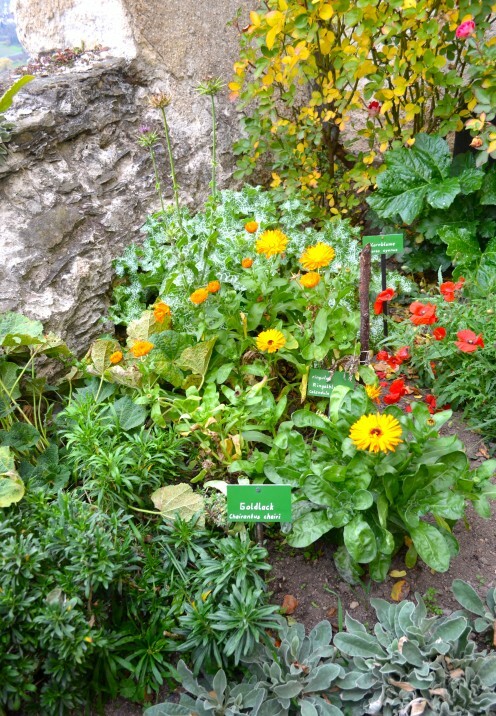 This is also where the castle maintains an herb garden with 150 plants known to be used in Europe during the Middle Ages. Our tour guide pointed out that many of these herbs had medicinal value, but others were said to be used by witches and were very poisonous. 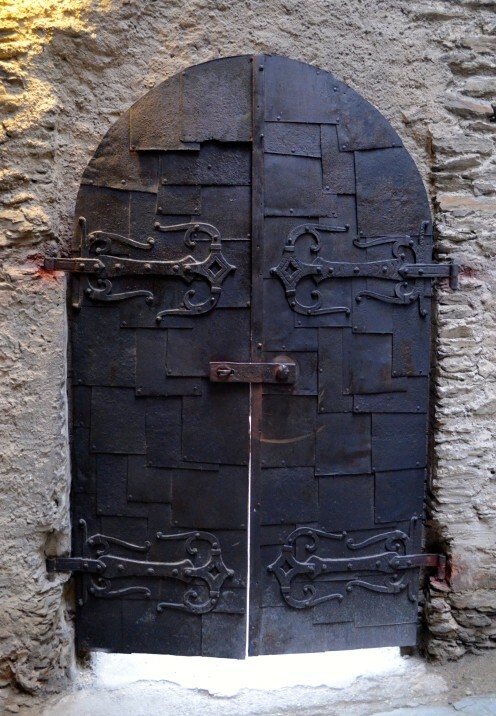 Stepping back inside, we entered the wine cellar. 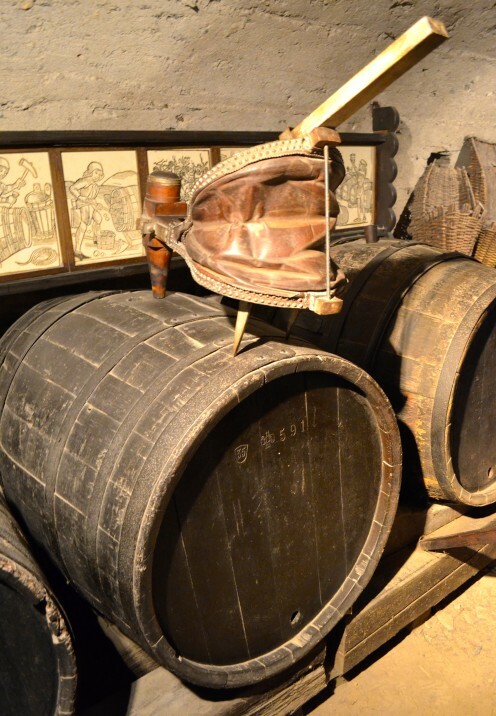 Grapes were grown on the castle’s great land holdings and wine was made and kept inside these large barrels. 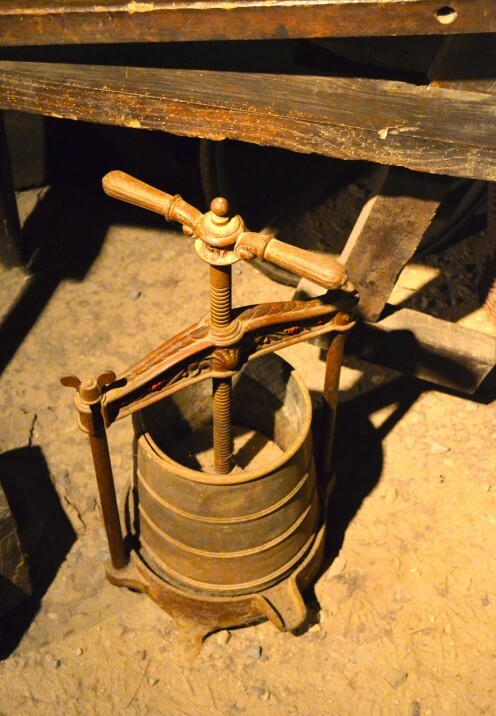 Water in the castle was unclean so everyone drank wine, not beer as you might presume, this being Germany afterall. 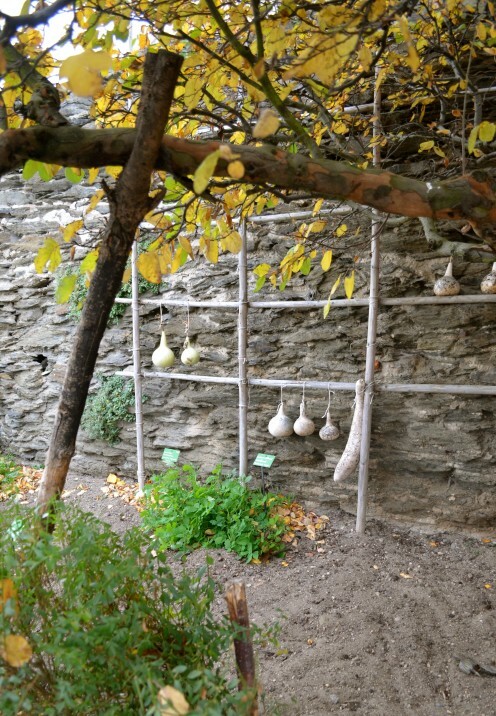 The pitchers hanging on the wall represented one person’s daily allotment of wine, which, by the way, had a very low alcohol rate. 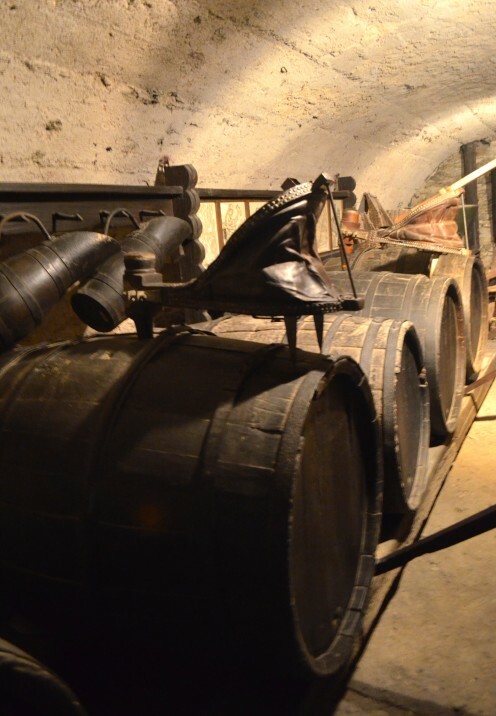 The bellows on top somehow aided in the winemaking process. 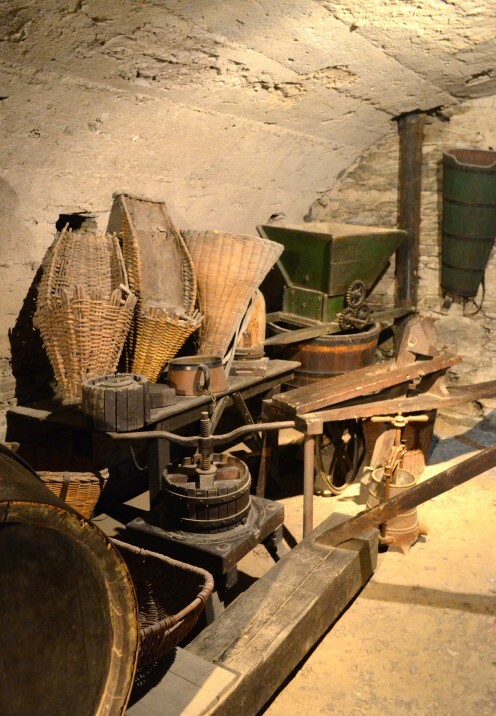 Also on display were the baskets that field workers used to carry the grapes, as well as many different grape crushing devices. 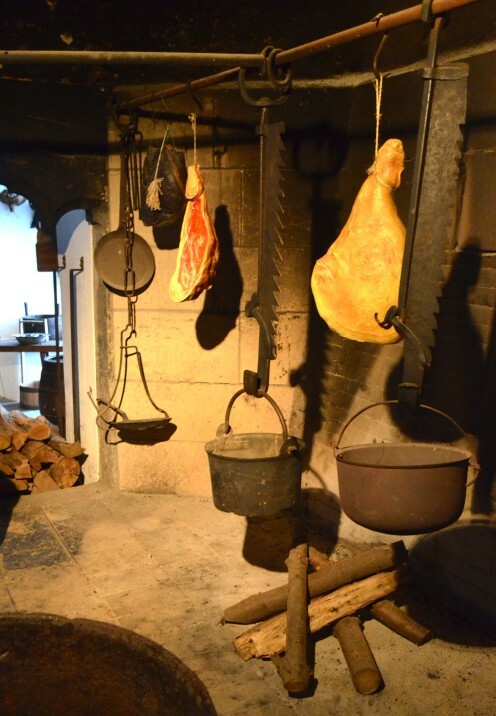 Next stop on the tour was the “Gothic Hall” which housed a vast kitchen, complete with all of the tools of the trade. 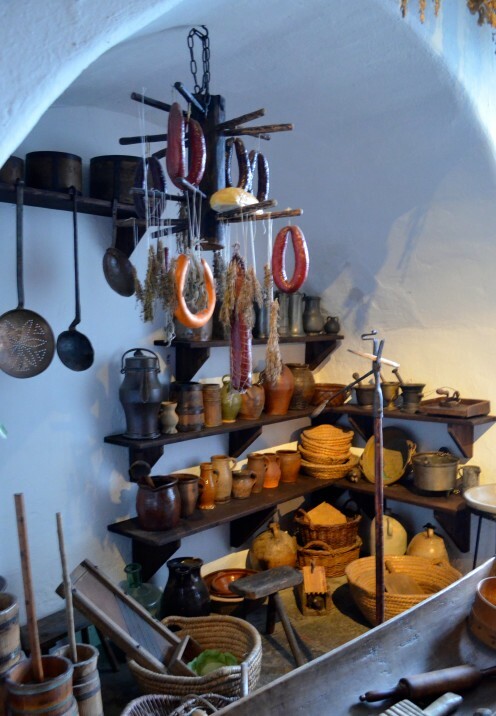 Pots were hung from notched rods, allowing the cooks to adjust the height of the pots above the flame, thereby controlling the cooking heat. 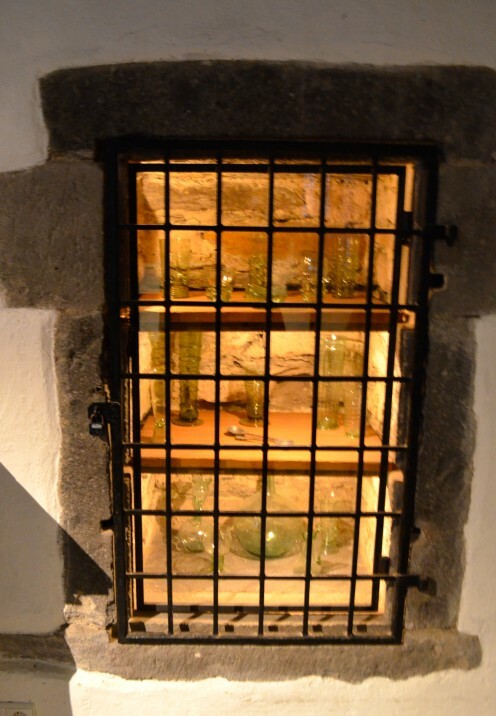 This lighted cabinet held beautiful ancient glassware. 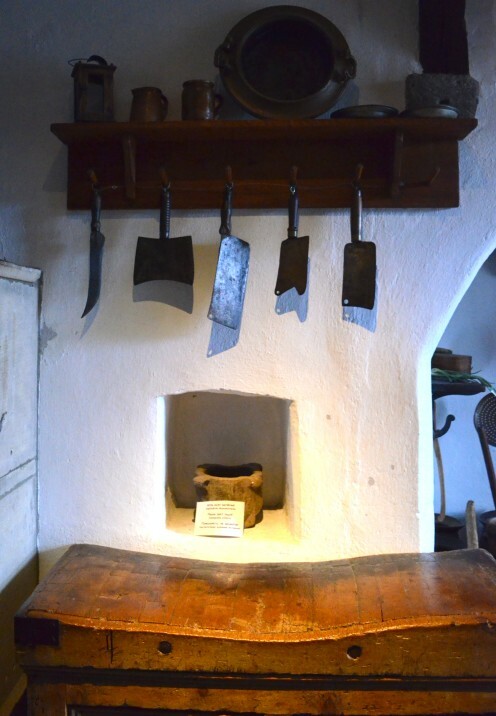 Look at this amazing butcher’s block with old cleavers and knives hanging above it. 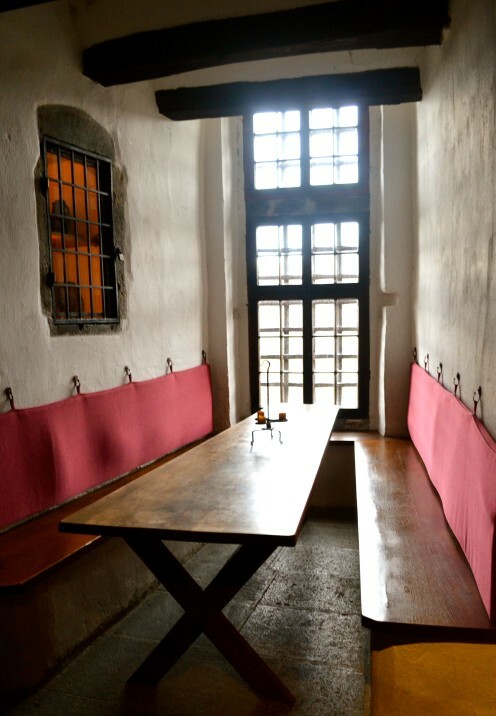 As the kitchen was a place occupied only by servants, this small table tucked into a window alcove was where they dined. 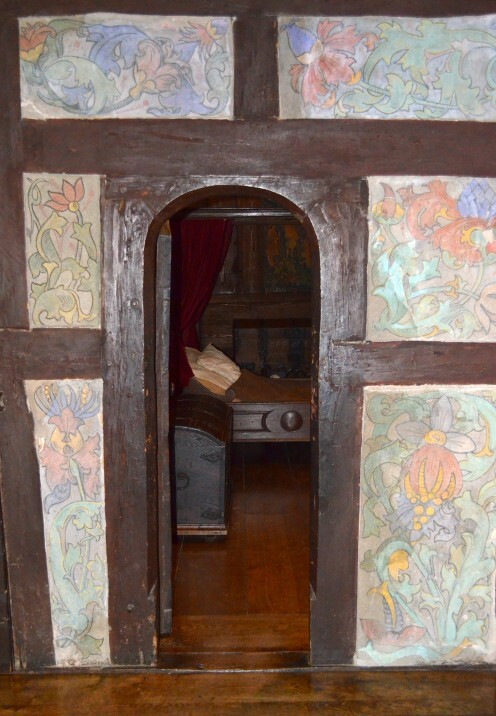 into the living chamber of the noble family. 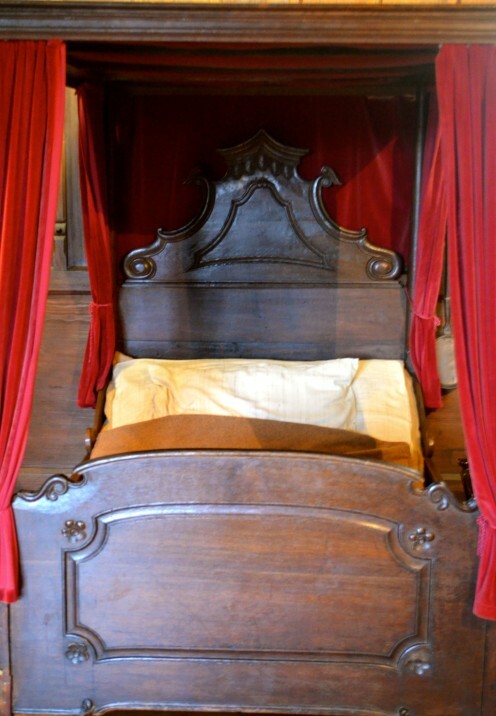 Here, we entered the “Bed Chamber” furnished with a canopied four poster bed and a cradle. 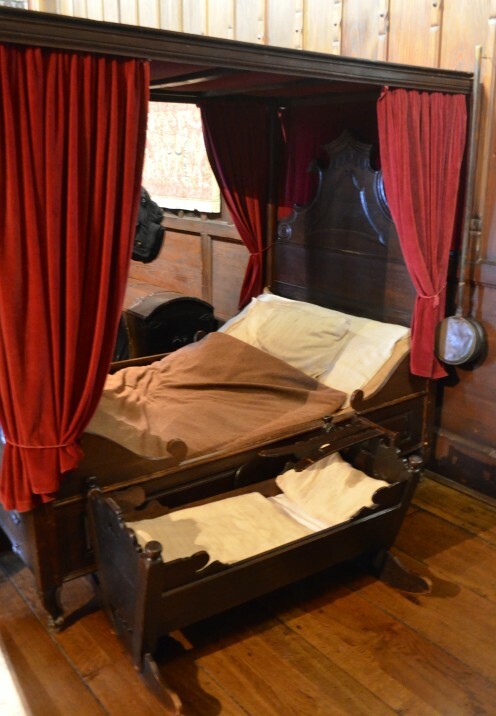 This room was one of the very few rooms in the castle that was heated by a stove, and the curtains surrounding the bed were used to trap the heat. This was not exactly a “King” sized bed! 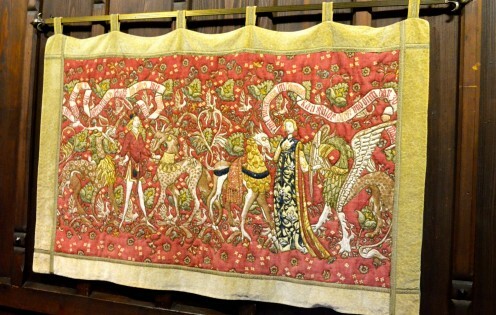 A seating area in the window niche was decorated by beautiful tapestries. 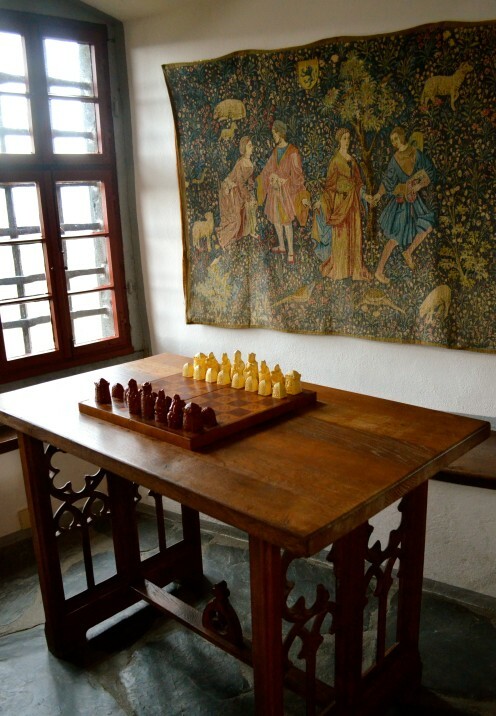 The chess board was used by the family during leisure hours. 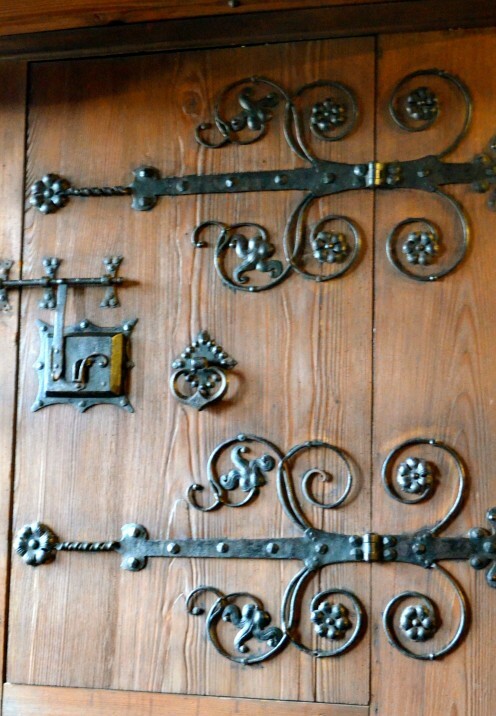 Being the wrought iron lover that I am, I was fascinated by the beautiful and ornate hinges on these bedroom doors. 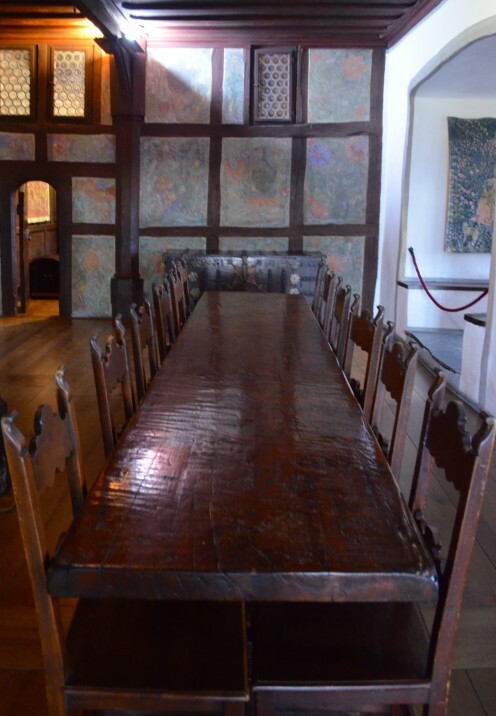 This “Great Hall” was the very heart of the courtly life within the castle. 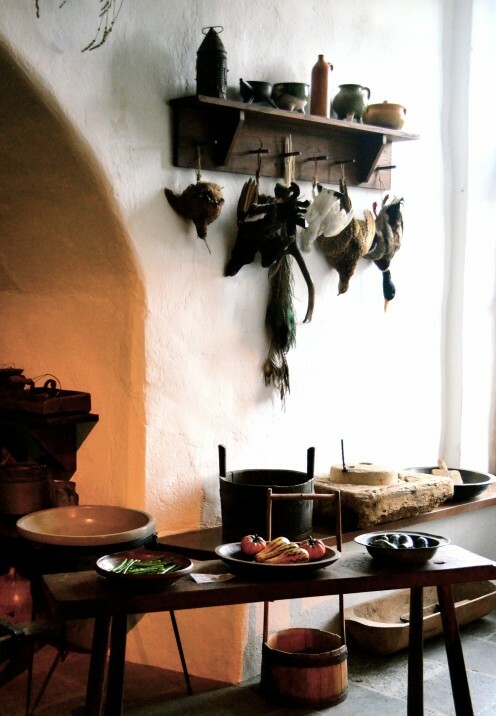 It was used as both a living and dining room… and something else. See that small door in the left side of this photo? Can you guess where it leads? 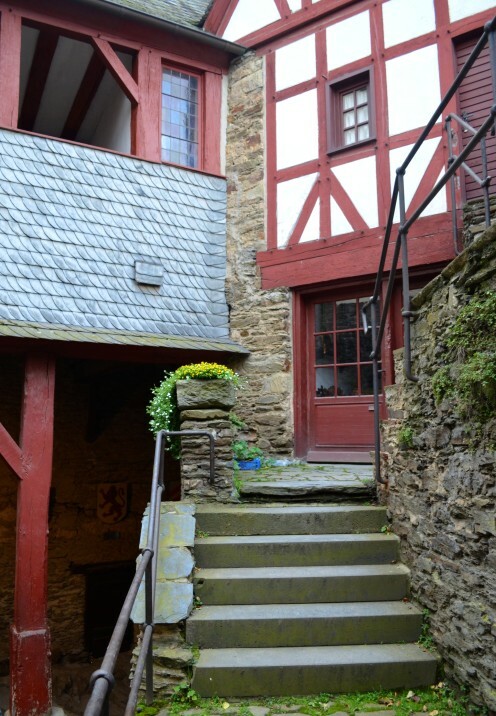 To the medieval toilet or privy. 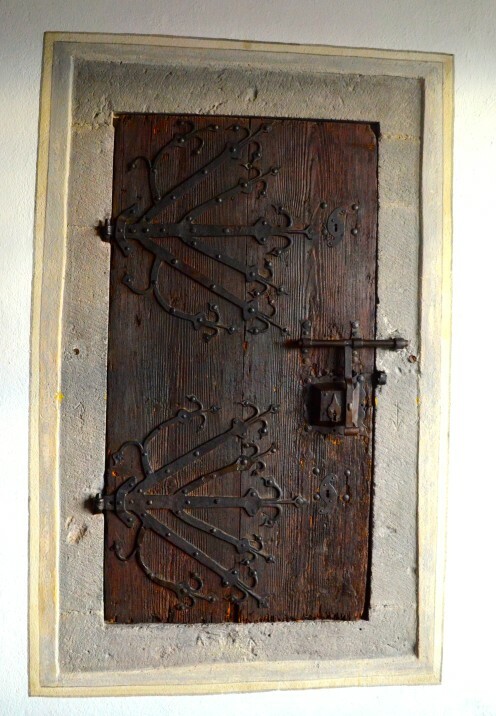 Apparently, the nobles thought nothing of relieving themselves in close proximity to where they dined. 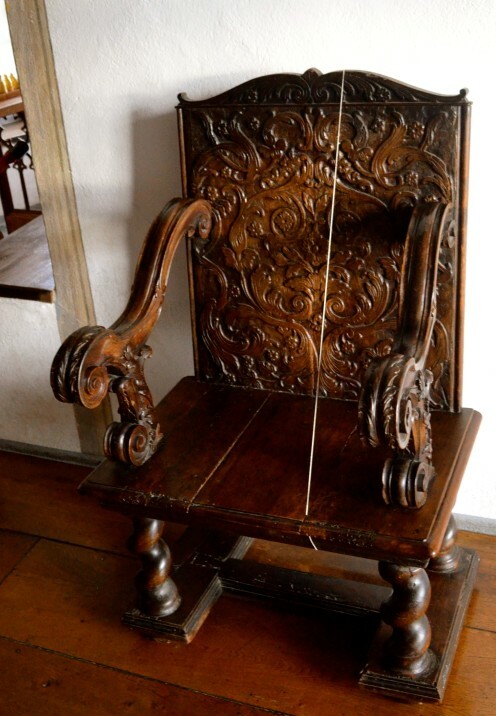 It was quite a throne, wouldn’t you say? 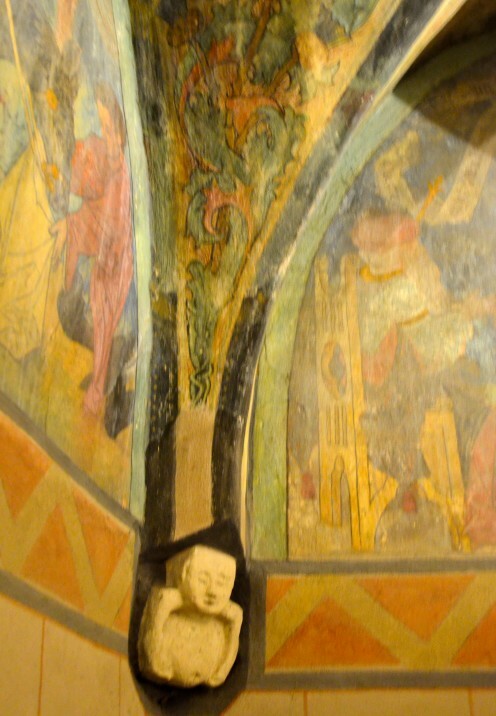 Next stop on the tour was the 14th century Gothic style “Chapel” with its beautifully painted walls and ceilings. 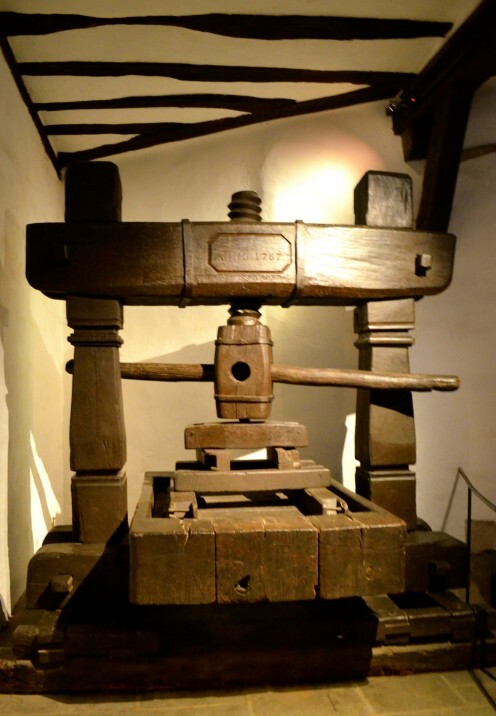 Marksburg Castle was named after St. Mark, and its chapel was therefore dedicated to him. 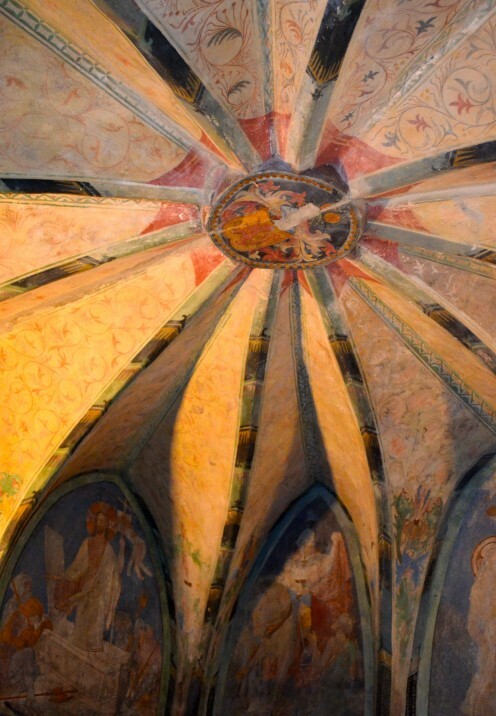 The vibrantly colored frescoes on the walls depict scenes from the bible. 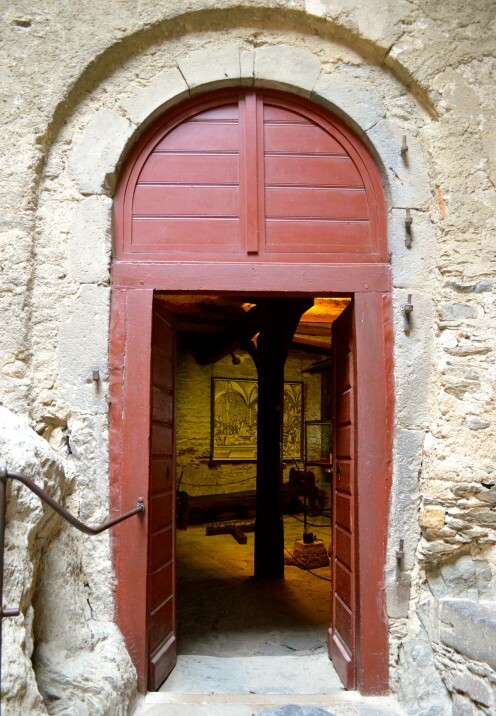 This small chapel was used by the noble family for their daily prayers and services. 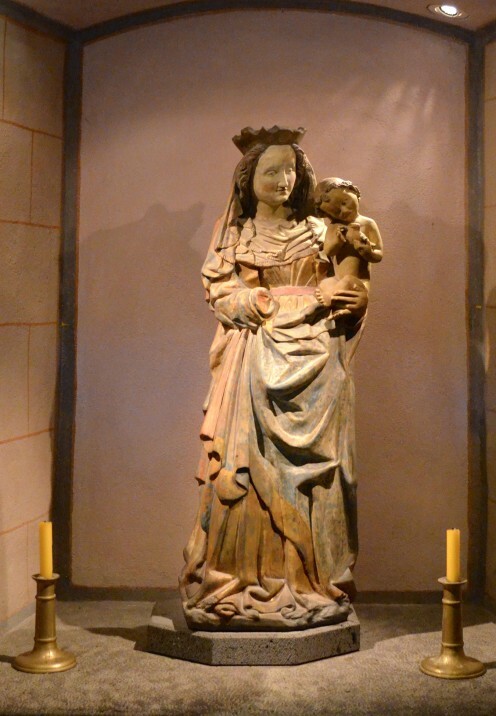 In one of the niches is a statue that is a copy of a 15th century Rhenish Virgin Mary & Child. 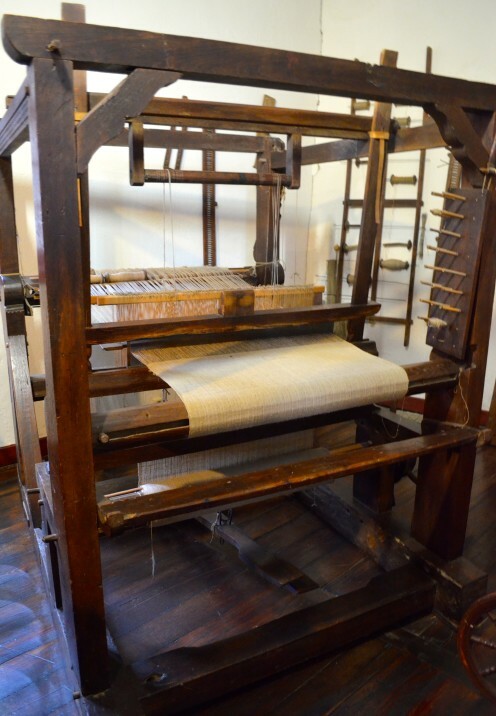 As I mentioned previously, castles needed to be places that housed all the necessities of life, weaving cloth being one such necessity. 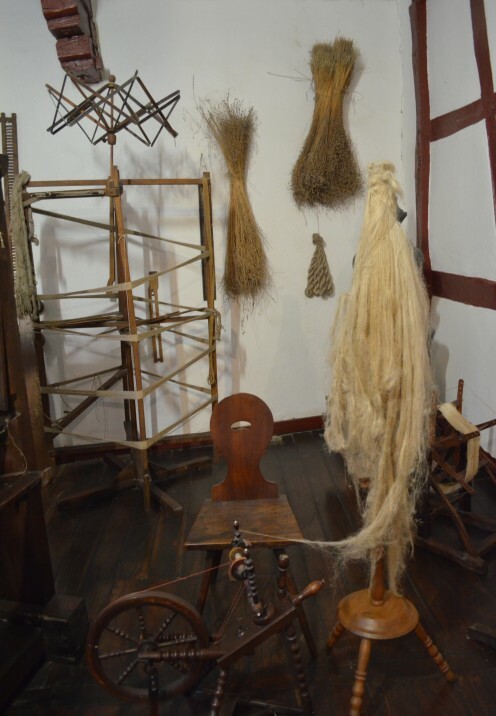 So it was done here, in a room dedicated to the activity of both spinning wool into yarn and weaving it into cloth. 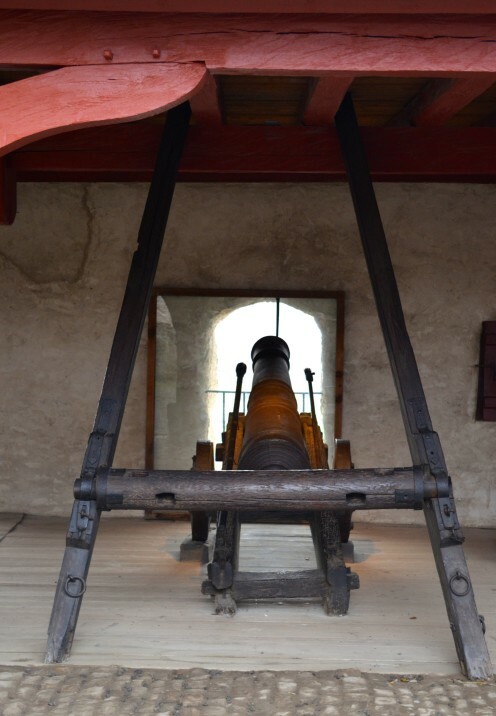 Our next stop was the “Armory” where over two thousand years of weaponry is on display. 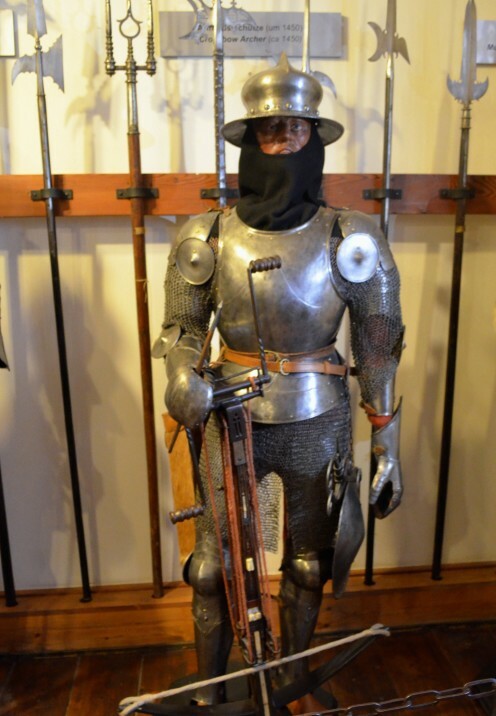 Here the “Gimbel Collection,” a display of 12 life-sized figures, demonstrate the changes made to armor and weaponry from ancient to early modern times. Our guide explained that the present-day military salute actually comes from the way knights in armor used to greet each other. They would tip up the visor of their face armor with their right hand in order to reveal their identity and extend a friendly greeting. 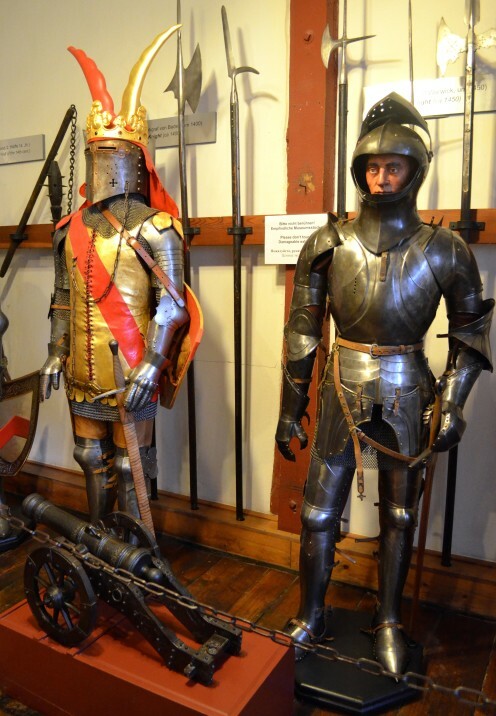 The armor on display consists of extremely detailed replicas as well as original pieces. 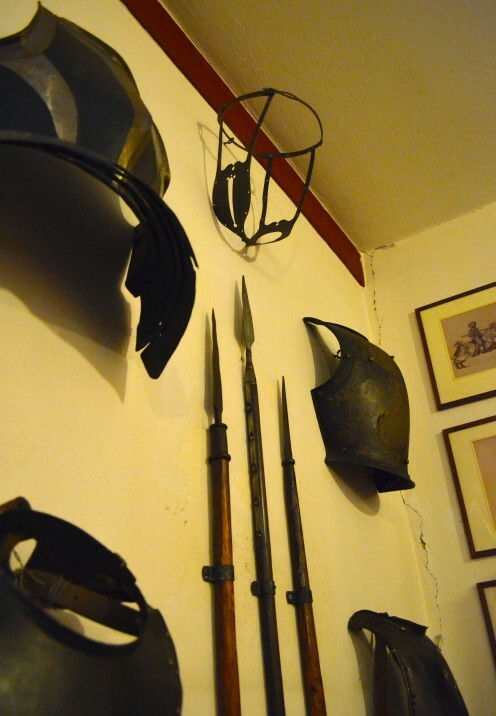 Another form of “armor” on display was a chastity belt you see there in the center top of the photo below. 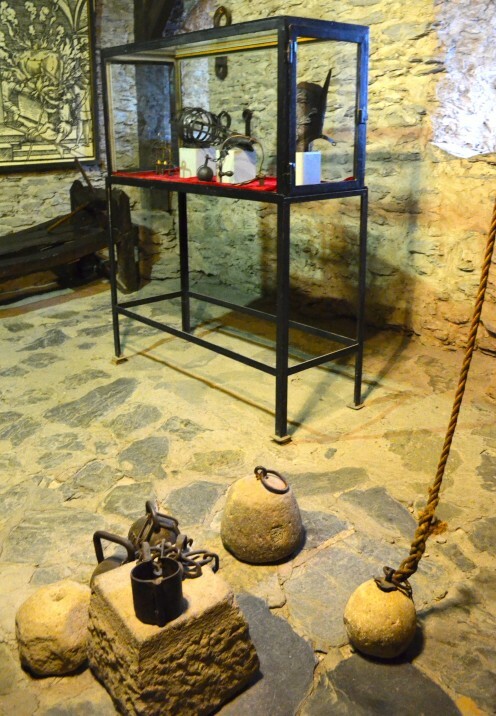 is an exhibition about torture and punishment in the middle ages and early modern days. And on that pleasant note I’ll end this very lengthy blog post. 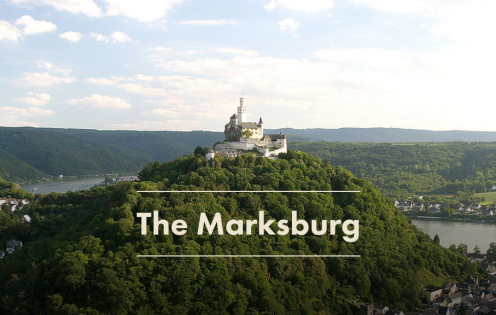 For more information about visiting Marksburg Castle, visit their website by clicking here. 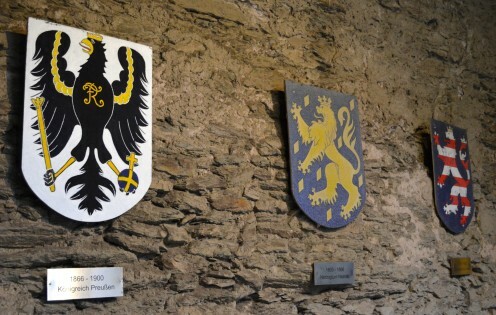 It should also be noted that Marksburg Castle is the home of the German Castle Association. 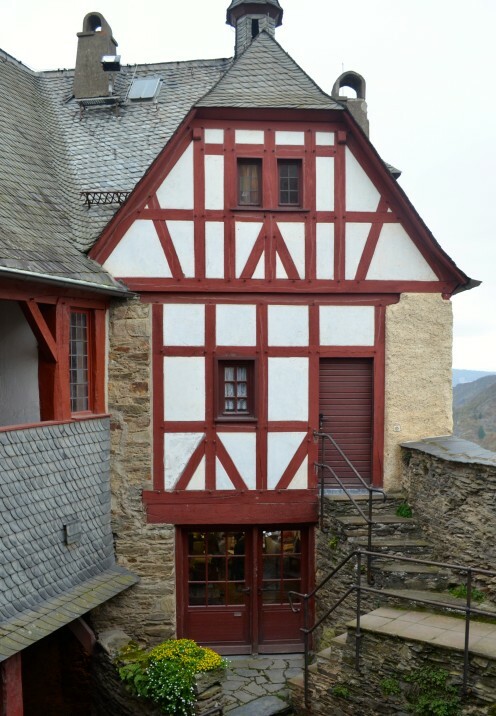 It is the oldest private initiative for the preservation of historical buildings in Germany. Its President actually resides in a section of the castle with his family. 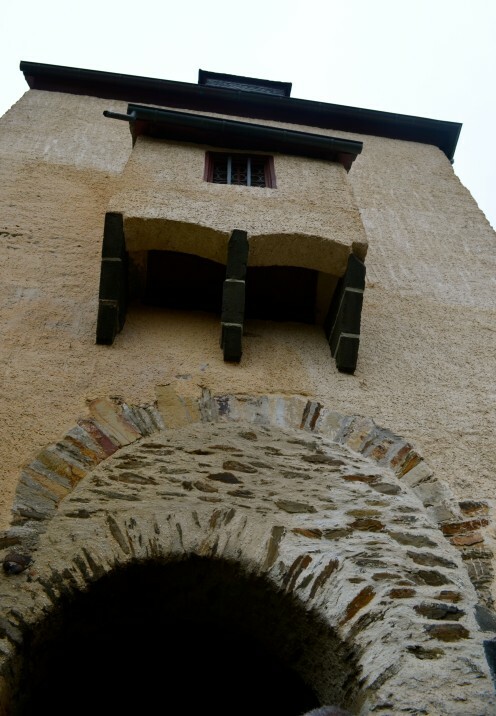 Marksburg Castle also houses the society’s library of over 30,000 books.